The Extrema Ratio BF2 R is a folder that is recommended for professional use – both Military and Law Enforcement. It is also recommended for you if you are looking for a quality EDC that is full size. It is a substantial folder. Fast plus easy opening. 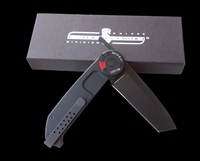 The blade is opened using Extrema Ratio's “high speed razor opening system”. This means the blade is opened by flicking a lever that extends beyond the folder's handle. The BF2 R is opened easily with one hand. Lever folds into handle when opened. This easy-to-open feature is a convenient feature especially in an EDC that is used for work chores. Available in either drop point or tanto point. The black handle is made of anticorodal anodized aluminum that is highly corrosion resistance and strong. The handle has the classic Extrema Ratio folder handle shape. Fits well in your hand and is configured to give you a firm grip. The BF2 R has a liner lock plus an additional manually activated mechanism that you should use for additional secure locking. The clip is a bridge clip that wraps over the end. Reversible side to side. Tip up carry.